Grant Osborne’s Hermeneutical Spiral is a terrific book on biblical interpretation and should be on every Christian worker’s reading list. For those who cannot work through its 500 pages of interpretive meatiness, the following steps will borrow from and distill Osborne’s (and other’s) work to produce a how-to for interpreting the Bible. Osborne uses the term “spiral” because good interpreters spiral down from the horizon of the contemporary reader to the intended meaning of the author. After arriving at an understanding of the intended meaning, the final step is to carry that meaning back up the spiral to apply it to the contemporary reader. 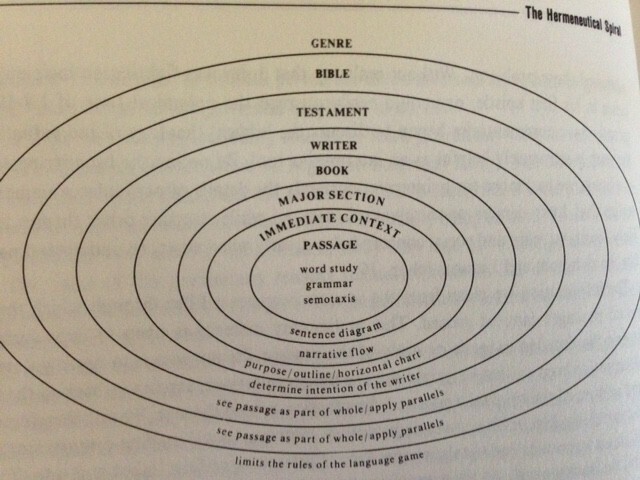 We set ourselves on this spiral by burrowing down through the layers of context that separate us from the biblical writers. These layers of context include the cultural/historical context, literary genre, how the author structured his/her work, and the immediate written context that surrounds the passage being studied. Osborne offers the following diagram of these layers, which he calls the “logical context.” The areas of context closer to the center are more influential in determining the meaning of the passage. In the natural process of reading, one does not go through strictly sequential steps to achieve a proper understanding. In practice, the various levels of context inform and correct one another. For instance, the specific word and sentence layout inform what we perceive as the overall structure and themes. As we see the structure, however, that structure may change how we understand the author’s use of a specific word. A biblical example is John’s use of the term logos (word or message) in his prologue (a distinct section encompassing John 1:1-18). In the prologue logos takes on eternal, personal qualities like Jewish personified wisdom. But in the rest of the Gospel, logos retains the more typical New Testament meaning of “spoken message;” the spoken message sometimes includes divine revelation, but not the personification found in John 1:1-18. Initially a reader may be tempted to read a personified sense into the next occurrence of logos, but in the reading process it becomes clear that the author uses the personified sense only in the prologue section. In this mutually informing way, the specific words give the reader clues about overall structure, and the structure informs the reader about specific word use. With this mutually informing nature of the interpretive steps in mind, I offer the following 10 steps for accurate biblical interpretation. 1.Grasp the historical context, overall genre, and meet the author (if possible). The first step involves understanding something of the history, place, culture, and literary conventions of the author. Study bibles and commentaries are helpful at this stage. For instance, one learns that Jeremiah was a prophet around the time of the Babylonian exile. His prophecies of warning, therefore, should be understood in the context of Babylonian invasion and not as if Jeremiah was a prophet like Samuel, who worried about more local enemies before the kingdom of Israel was established. 2. Do an inductive reading through the book, trying to discern the main points of the sections and the overall thrust of the book. This step involves doing an x-ray to discern a skeleton outline of the book. As you start to see the various sections, I suggest writing down what you perceive is the main point of each section. While it is best to read through the whole book, a commentary can help give the structure of longer books. Commentaries also can identify a smaller section for a time-strapped preacher to focus on (like doing the x-ray of a hand instead of the whole body). Although a read through is time consuming, this step is important for understanding individual passages and how they relate to the rest of the book. For example, you are studying Acts 1:1-11 and in verse 8 you read Jesus’ words, “But you will receive power when the Holy Spirit has come upon you, and you will be my witnesses in Jerusalem and in all Judea and Samaria, and to the end of the earth.” Without reading the rest of Acts, you might not realize that this verse previews the story line of the rest of the book. If you make a structural outline, then reread the passage, you would see that Acts 1:8 describes how the book of Acts unfolds. A part of the author’s intended meaning probably is to frame the story for the rest of the book. 3. Set the limits of the text. In this step, the interpreter tries to interpret and communicate the text in the units that the author intended. Using the structural x-ray and contextual clues, divide the larger section or book into a manageable unit to study and teach—but a unit that follows the author’s presentation as closely as possible. We naturally follow this practice in other disciplines. Teachers usually assign and teach according to the chapters of the textbook’s author. Following the author’s intentioned breaks and transitions makes it easier to teach and understand the content. The biblical writers did not use modern conventions like chapter divisions (the chapter and verse numbering of modern Bibles are a later addition—yet they can help discern sections as long as the interpreter realizes their later origin), but there are clues to where the author intends a shift or new unit. Through a shift in scene, the introduction of a new argument, a change in genre, a keyword, or other technique, the author signals a change. These signals help mark out the smaller units that can be reasonably treated without doing violence to the author’s intention. An example of such violence: One could not responsibly preach 1 Corinthians 2:1-4 without including verse 5. The author did not intend for readers to drop out mid-sentence! 4. Diagram the passage and write down an initial understanding of the author’s meaning and main point(s). Identify the main verb(s) that carries the sense of each sentence, and then determine how the other words and clauses relate to that main verb (support, causation, result, explanation). Through this process, the interpreter should be able to articulate an initial understanding of what he or she thinks is the author’s meaning and main point in the passage. The process of writing down the words and using arrows and spacing to create a sentence diagram often clarifies the author’s line of argument and the narrative flow. In diagramming, one sometimes realizes they incorrectly understood the author’s unit of thought, so they adjust the scope of the passage to better match the author’s presentation. 5. Determine the genre of the passage. In the initial step of interpretation, one became familiar with the overall literary genre of the book, but many different genres can appear in a single biblical book. While many would consider Jeremiah a book of prophecy, Jeremiah contains many verses in the narrative genre. In this step, the interpreter seeks to answer the question: Does my understanding of the passage’s meaning take into account its genre? A passage that uses the poetics of prophecy should be read differently than narrative because the author and reader of that day understood that these genres carried different expectations. The modern world also holds different expectations when reading different genres. We read a political flyer differently than we read a novel or newspaper. We expect persuasion in a political flyer, fiction in a novel, and objective reporting in a newspaper, and we interpret these different genres according to those expectations. For an easy to understand book on biblical genres and how to interpret them, I suggest Robert Stein’s A Basic Guide to Interpreting the Bible. 6. Relate the passage to the immediate context, major section, and book. This step focuses on relating the passage to the material that surrounds it. The interpreter seeks to answer questions like: How does the previous section lead into this one and how does this passage lead into next? Does my interpretation take into account this relationship? Does this passage pick up on larger themes or terminology? This is the step people typically associate with context, and it should be very influential in our interpretation. In the inductive reading we hopefully took into account the immediate context as part of the natural reading process, but now we are even more intentional about discerning how the meaning of the focus passage fits into the material surrounding it. If our understanding of the meaning does not seem to fit in with its surroundings, we are probably misreading the author’s intentions. Examples of the importance of context for understanding particular sentences appear in everyday life. In my PhD studies, a professor returned an independent study paper (which accounted for 100% of the course grade) with some really pointed and extensive criticisms. I was rather upset that all my work had been so poor. But when I went back to his email, I had missed that these criticisms were given in the context of an overall grade of an A with a comment that the paper contained good research. Without the overall context, I misinterpreted the specific comments. 7. Relate the passage to other works of that author (if applicable). If the author has written other books in the Bible, then how he uses terms or concepts in that other book may illuminate the usage of those terms/concepts in the focus passage. Questions to ask and answer are: Does the author use the same concepts/words elsewhere? Is that relevant in this case? Example: John uses many of the same terms in 1 John 1 as he does in the first chapter of the Gospel of John. It is reasonable to assume that terms like “word,” “life,” “ light,” “witness,” and “truth” in 1 John 1 carry some of the same transcendent nuances as the Gospel’s first chapter. 8. Relate to other Biblical writers. While a writer’s own works are the most informative, the biblical writers share a similar worldview and culture. The similarities in their historical, religious, and language contexts can inform our understanding of any biblical writer. Biblical authors in the same testament are most relevant and should be considered first, and then the passage should be related to writers from the whole Bible. Questions to ask and answer are: Do other biblical writers use the same terms, themes, subjects, settings, or arguments? If so, is the other writer’s usage relevant in this case (not always, how Paul uses the term “flesh” may not be the same way that John uses it)? *Note: New Testament quotations of the Old Testament should be considered earlier, in step 4 when diagramming the passage. In step 4 one determines how this quote relates to the rest of the passage and how it is being used. At step 8 it is helpful to go even deeper. The OT quote is a direct part of the author’s intent, and one should ask how it advances the author’s argument (OT quotes in the NT usually give authority or show fulfillment). At the very least, the interpreter needs to read the OT quote in its original context and then ask how that original use may inform the NT author’s use. 9. Re-examine the meaning and main point of the passage in light of the other steps. All of the relationships you noticed and the passage’s place within the flow of the book need to be re-applied to the meaning and main point. Of course, re-applying your findings should be carried out at the end of every one of the other steps, but sometimes we forget to integrate everything. We do not want to simply gain interesting information. Our purpose is to understand the meaning of the passage. All the previous steps are means to this end, so we reexamine and reapply all our work to our understanding of the passage’s meaning. 10. Relate passage’s meaning to your own context. After arriving at your best understanding of the author’s meaning and main point, that meaning must be applied to your own context. An accurate understanding of the original author’s meaning remains only an academic exercise if you do not carry that meaning back up the spiral into your own life and world. Questions that should be asked and answered are: How does the author’s meaning apply to today’s context? What contemporary issues intersect with the author’s meaning so that if the author were alive today, he would say, “I wasn’t referring to that specifically, but my words do address that issue.” If we apply this meaning to our lives, what would we actually need to do? Are there examples of how applying this meaning looks in today’s world? What in our context is different/same as the author’s context and how does that affect the application of the author’s meaning? Answering these questions helps interpreters spiral both down and up so that the meaning of the text can be understood and applied today. While the above process consists of only 10 steps, those steps require much time and effort. Truly rewarding and accurate interpretation requires diligence. We are so accustomed to proof texting and the artificial carving up of the text that we forget arriving at an accurate understanding of an ancient, culturally different text requires effort. The reward of such effort is a deeper, more accurate understanding that also has coherence. Following such an interpretive method also makes the Bible accessible to any reader who is diligent, so any reader can interpret the text and stand on the text without having a theology degree. While the above process seems more involved, it is actually more accessible—especially in today’s information age. The above steps also require a humility and curiosity because they are always open to new information. As you learn more in each contextual ring, you take that information into account and allow it to shape your interpretation. For this reason, commentaries and other research tools should be integrated into your own understanding of the text. These tools can also act as short cuts in the above process because no one has unlimited time to research the text. Only remember that research experts provide great help in interpreting, but they can’t replace your own work. You are the one who must accurately understand and then relate the passage’s meaning to your own context. It is through you that God will speak to the people around you. Accurate interpretation means the timeless Spirit-inspired message spoken in the scriptures can be spoken again with the authority and inspiration of the same Spirit who inspired that message the first time! This post will also be available as a pdf on the “Through and To You” page.